Think of college costs in terms of cars. When we shop for used cars we often look at the Blue Book Value. It is a good way to get a bearing on how much a car is worth before we put down an offer. Putting education costs in terms of what we pay for a car gives a little perspective. At least, it helps me. 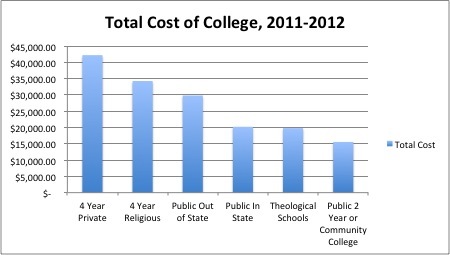 With this in mind, these are estimates of the total cost of an education based on institutional data submitted by the institutions to the National Center for Education Statistics. If you want to go to a religious school and then seek a call in the ministry, you will have to pay. These are costs for each year. Of course, you can upgrade if you shop for a used car, but let’s not take the metaphor too far. Another way to frame this is that you are putting down for a second mortgage and it could cost you more up front. The point is that this is expensive stuff – even if you happen to have enough cash and credit to accumulate four cars over four years. The following are average yearly total cost values. Source: U.S. Department of Education. Institute of Education Sciences, National Center for Education Statistics. These total cost estimates are what you can expect to pay out for the whole deal. It is what we call the “sticker price.” These costs are most often paid for in loans, grants, scholarships, and other forms of aid if you can’t front the money out-of-pocket. Any of those financial sources will feed this total cost in some way. Talk about college soon. Visit a few colleges during or even before high school. Start getting in the mind of your adolescent to help her find out what she wants. This will help you to form a set of goals. If you want to go to institution A, here is what you need to do in the next few years to get it. Religion is a factor here. Religious institutions are very expensive, regardless of the branding. Think about careers. What career plans will land a job and for how much? What risks are you willing to take? Plan early academically. That first day of class freshman year through the end of junior year in high school are absolutely critical just to get in the higher education front door. This is a competitive place. It is important to up the momentum in the Senior year, filling out applications, and exploring grant and scholarship opportunities. If enrollment continues to flatten or even decline as it has over the past couple of years, expect costs to jump even more than expected. Don’t get freakishly obsessed with the planning, but don’t sit on it either. Look for grants and scholarships. Grants and scholarships are at a premium since it is straight cash going in to the bill. There are all sorts of grants both small and large for students left by alumni and benefactors. Getting these may mean serious effort by the student and the family, but it can be well worth it. But without paying attention to the above, you will have less of an opportunity to cash in on these valuable sources. Explore some of the other campuses. For a four-year public institution these are good ways to get your foot in the door. You may also find that you like it enough you want to stay! These campuses that offer seamless transfers into the main campus which can be more expensive and selective. There is no shame in community college. If your kid does not know what to do with life, send him to community college to “figure it out.” Don’t let good money follow bad. These colleges are getting better even if they are always on the public funding chopping block with other sources of public education. With public education clearly being a cheaper option, governments cutting education funding is a damn shame. Get in on it and maybe even get more involved in the local government to have a say in what happens with your tax money. Get a job in higher education. I chose to work in higher education long before I had kids. When my first son came into the world only then did I see the benefit of working in higher education: tuition discounts. In many real ways that is the core of my college funding. This, of course, is not why I work in higher education, but it is a large reason why I like working at an institution as solid as Penn State! If you want to go that route parent, do it early. These benefits often do not kick in for a couple of years after date of hire. Where a car depreciates in value a degree appreciates. That’s the good news. Education is an investment. Fronting the cost of that investment is the challenge. As your son or daughter enters high school, the grades start going on the transcript are the same grades admissions committees will review in three to four years. Have a chat about the future. Come up with a plan now. Waiting can cost you big time in the future.